Is the "ninda" of US war in Iraq in India's long-term interest? A senior Kuwaiti diplomat here disclosed today that the USA was in communication with senior leaders of Iraq’s ruling Baath Party as well as the top brass of the Iraqi armed forces and indicated that “some sort of compromise formula” might have been worked out between them and the coalition forces. 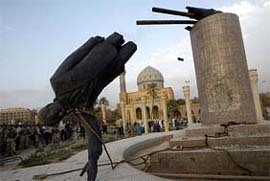 As Saddam Hussein’s regime appeared crumbling on the streets of Baghdad, Parliament today adopted a unanimous resolution deploring the US-led war on Iraq. Asserting that no case of dreaded SARS has been reported in the country so far, the government today said it had taken a number of steps at international airports and ports including the screening of passengers to the check entry of the mysterious disease. Rockets to run on wax? The multi-purpose Indian national satellite INSAT-3A will be launched into space by Ariane 5G in the early hours tomorrow after a day’s postponement due to an anomaly in a transmitter of the satellite. The Indian Space Research Organisation announced this evening that the launch would take place between 4.19 am and 5 am IST tomorrow. Decks have been cleared for the much-publicised online lottery in Haryana following negotiations between a high-level official committee and the representatives of five companies who had responded to the Haryana Government’s invitation. 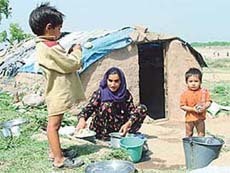 About 400 families of Hindu, Muslim and Sikh migrants from terrorism-hit districts of Rajouri, Poonch and Doda in Jammu division are living in a miserable condition on the banks of the Tawi at Belicharana here.